The creation of this unique body was a very extended process. 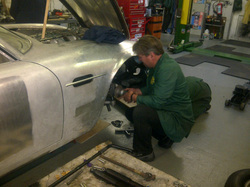 The author of Palawan's "Aston Martin Zagato", Stephen Archer, was called in to help. The process involved two of the UK's finest panel beaters and took three years. 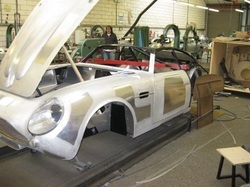 The chassis with key mechanical components was delivered to Bodylines for the fitting of the Superleggera structure and initial panel fitting. 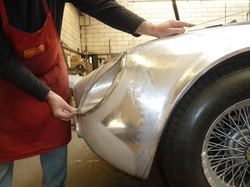 Most parts of a Zagato are built of aluminium to shed weight in an attempt to be more competitive against the Ferraris. The dashboard and instrument binnacle were steel on the standard DB4 but all aluminium on the Zagato. 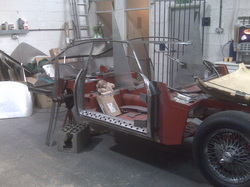 Getting the front end correct was particularly difficult as the only reference was photographic. All the skills and experience of Shapecraft's Clive Smart came into play. Attention to detail was very high and many panels such as roof, boot, bonnet and wings were remade by Shapecraft to get the car exactly right. Once the body shape was satisfactory the car had all the key mechanical and electrical components test fitted at Rex Woodgate's workshops. 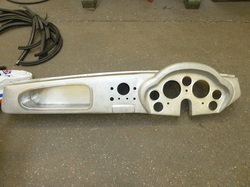 Any alterations to the chassis, such as additional brackets, were made prior to the car being painted. 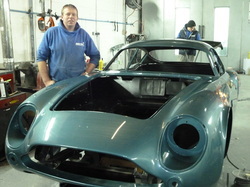 Chris Woodgate works on some of the world's most important Zagatos.